Across Europe, as economies find themselves tottering in the face of deepening financial and social crises, various alternative initiatives are gaining ground, providing hope for a different future. A day after I reached Barcelona in Catalonia (Spain) in the last week of May, its first woman mayor was elected, much to the delight of large sections of its civil society. Ada Colau, a 41-year-old activist who has fought with social movements against forced evictions, is with Barcelona En Comú (formerly Guanyem Barcelona). This is one of many new political outfits in Spain that are rising from peoples’ movements of various hues, including those seeking fundamental changes away from an economic system that has left 50 percent of the country’s youth unemployed, created a massive unpayable public debt, and caused ecological devastation. Over the next few days I met with a number of researchers and activists and practitioners in Barcelona who are in one way or the other seeking alternative futures. There seems to be an explosion of experiments towards sustainable farming and producer-consumer cooperatives,eco-housing and communes, solidarity networks, complementary or alternative currencies, occupation of empty buildings (squatting) by the homeless or for social activities, cycling and car-free spaces, reclaiming the commons in cities, and much else. Though still marginal in a society that is overwhelmingly consumerist and wasteful as also facing enormous social problems (including a resurgent right-wing in many areas), these initiatives are growing and provide hope for a different future. This would especially be the case if the grassroots mobilisation in such initiatives can be combined with progressive new elements in the state, such as the ones that have taken power in Barcelona … and if the rapidly rising political formation Podemos takes over Spain in the coming national elections. I will illustrate this with a few examples that I got to know of during my visit. One is theCooperativa Integral Catalana (CIC), a network of activists working on various aspects of collaborative, ecologically sensitive living. As CIC activist Ale Fernandez told me, sitting on the roof of one of their working spaces in the midst of an urban herbal garden, the initiative has a very interesting origin. 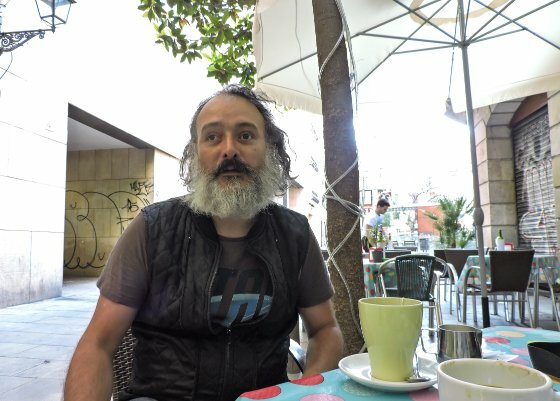 In 2006-08, activist Enric Duran Giralt carried out an act of financial rebellion, borrowing 492,000 Euros from various banks, distributing this to a number of initiatives described as alternatives to capitalism, and refusing to return the money, arguing that banks had been stealing from ordinary people for decades (earning the nickname ‘Robin Bank’!). When arrested (and later released on bail), Duran pointed out the irony that chief executives of banks who had ruined the lives of millions of people by their irresponsible acts leading to the 2008 financial crisis, were being let off scot-free. The CIC was started by him and others as a model of how people could live perfectly well without capitalist institutions such as banks, through solidarity and collective actions.The CIC has also evolved into the proposal for a global cooperative called Fair Coop with its own currency (faircoin), similar to Bitcoin but with justice and sustainability principle. CIC worker Joel Morist I Botines took me out for coffee, and with his eyes shining brightly and a big unruly beard flying in the wind, gave me a run-down on all that the collaborative does: The use of unused buildings or other available properties for collective, social housing; community-led, free and alternative education that is integrated with community living; sharing knowledge platforms; producer-consumer exchange especially of organic, ecofriendly products (food, soap, laundry items, toothpastes, etc); technological innovation and collective repair spaces; social or ‘free’ community currencies in which exchanges can take place without using euros and movie-making through crowdfunding. CIC is involved in these and much else. It has one permanent assembly for decision-making, but many individual processes or projects linked to CIC have their own assemblies, in an attempt towards decentralised or direct democracy. There are about 5000 user members in the producer-consumer exchange. The full-time paid employees of CIC, interestingly, can even have their salaries reduced as they are encouraged to obtain more and more of their living needs through sharing, alternative currencies, and other ways that reduce the need for money! The second initiative I saw is fascinating because it is not something we are used to in India. Can Masdeu is an old hospital building that had been abandoned for a few decades and was occupied by an international group of activists who converted it into a housing and social centre in 2001. They achieved fame in early 2002, when some 100 police came to evict them. Using passive resistance and tactics that would have meant the police possibly injuring themselves and the occupants if forcible eviction was attempted, and eventually winning both significant public support and a local court’s favorable judgement, the activists managed to stay on. Since then, repeated attempts by the Barcelona administration to evict them failed. (Incidentally, the new Barcelona mayor was involved in protesting against these attempts). 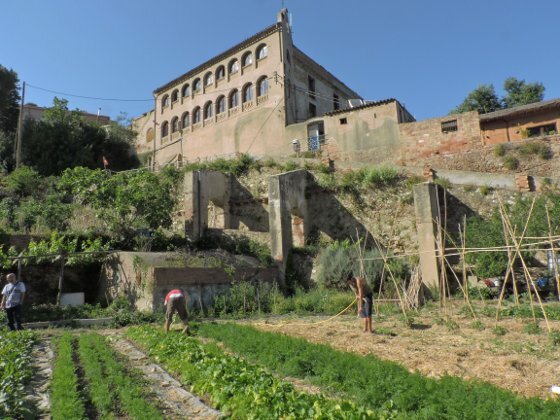 The 24 people who now occupy Can Masdeu have converted it into an example of collective living, permaculture and organic farming, simpler lifestyles, baking and cycle repairs and other survival or livelihood activities, and through all this less need for money. Can Masdeu’s building and surrounding fields and forests have also become a space for residents of Barcelona (and elsewhere) to come and volunteer for practical work, do joint activities on Sundays, tend to little garden plots assigned to them, bring schoolkids to get exposed to a different life and more. Claudio Cattaneo, one of Can Masdeu’s veterans, father of a two-year-old child, and also a researcher who has studied the ecological economics of squatting in Barcelona, was quite frank that this was still an evolving experiment. There are many weaknesses to be addressed still (for example, energy use remains relatively high, and it is not yet clear how elderly people would fit in), but even in his statement of gaps one could see that there is already a lot that the place has achieved. Can Masdeu’s occupation is still technically illegal. I asked Ale Fernandez, one of the early residents, whether he would prefer it to be legalized; he said he was in two minds, it would be ok if there was a good law covering it, but it was also scary to be “part of the machine,” referring to the system that could gobble up such initiatives in a minute. This is a dilemma many alternative, radical initiatives face in many countries: whether to remain ‘outside’ the system and face continued harassment and possible closure, or to get legitimised by it, which entails the risk of getting institutionalised, less ‘edgy’ and less radical. Another widespread trend in Europe encompasses a similar paradox. People in several towns are trying out social currencies of various kinds. In this experiment, the unit of exchange between producer or service provider and consumer is a locally generated ‘money’ or equivalent unit. For that particular exchange, therefore, the relationship is outside the dominant monetary system. In so far as many of these are ‘complementary’ currencies – working in limited circles, supplementing rather than replacing the dominant currency – they do not really threaten or seriously challenge this system. But some, if they become big like the Bristol pound, can indeed be subversive. In Barcelona, I met Susana Martín Belmonte, who has helped write a chapter on social currencies for the Barcelona En Comú party that has just come to power in the city. I did not fully understand it, but Susana stressed that this model moved away from bank-related interest, and money as debt and speculation, that was at the centre of the economic crisis. Instead, it focused on positive value creation and trust-based economic exchanges, an early version of which is to be tested in Barcelona. 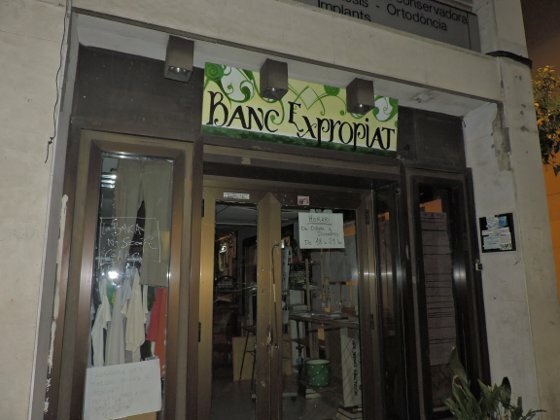 This initiative is part of a wider European Union funded process of piloting social currencies. There are however challenges to making this widespread enough to challenge the currently dominant money system. Researcher Kristofer Dittmer, whom I met at the Autonomous University of Barcelona, recently conducted an interesting review of local currencies of various kinds. He concluded that there was not significant evidence of them leading to ‘community-building, advancement of alternative values in economic exchange, facilitation of alternative livelihoods, and eco-localization’, all of which are criteria that the Degrowth movement in Europe espouses. But there are indeed a number of local benefits, and he said he had not looked at the Bristol pound, which may be one of the few to achieve larger social and economic impact. Belmonte, however, feels that if the kind of social currency she is promoting spreads widely, it has the potential to undermine dominant economic powers. This ongoing experimentation and debate in Europe should be of major interest to us in India, as increasingly our movements will also want to look at fundamental changes in economic and monetary systems. The above initiatives are part of a growing search in Spain and the rest of Europe for alternatives: different ways of being, living, working, and relating that in various degrees question or rebel against the currently dominant economic and political order. I learnt about these and others over several sessions and treks and meals with a wonderful team of people associated with the Institute of Environmental Science and Technology (ICTA) at the Autonomous University of Barcelona, including the ecological economics guru Joan Martinez-Alier, and his younger colleagues Federico Demaria, Daniela del Bene, Aili Pyhala. It is through my interactions with them that I came to know of Som Energia, for instance, which is a cooperative buying renewable energy and putting it on the grid, making it more accessible to households. Eticom is a cooperative offering mobile services as an alternative to the big private corporations while ECOS is common working space where many of these cooperatives and projects have their office, with shared cleaning, transport, insurances, finances, design and printing.I also heard more about the movement towards ‘degrowth’, which espouses a considerable scaling down of Europe’s energy and materials use, and encompasses philosophical, ethical, economic, political and socio-cultural elements in its advocacy. With the above team at ICTA and other local researchers and activists, we discussed the similarities and differences between degrowth and other alternative approaches from elsewhere in the world, including Buen Vivir and Sumak Kawsay in Latin America, swaraj or radical ecological democracy (RED) in India and ubuntu from southern Africa. A couple of presentations I made on RED/swaraj were well-attended and generated very interesting discussion on a host of complex issues. People were very interested in the various examples of alternative initiatives that I mentioned, and asked many critical questions about them. It was clear that the presence of such initiatives in both Europe and India offers us a great opportunity, to exchange experiences, mutually learn, evolve common futures where globalization is about freer movement of ideas and cultures and people rather than of finance, and build solidarity networks that can also be a political force. These initiatives in Europe are of course still marginal in a continent that has made its ‘progress’ based on colonial and neo-colonial exploitation of the south, and where a highly materialist lifestyle is as ‘natural’ as breathing air. Increasingly, however, as the economies of Europe themselves face crises and it becomes clear that tinkering around within the same system is not helping to resolve them, as knowledge of the ill-effects of these lifestyles for the rest of the world and for themselves spreads, and as ecological and social movements gain ground, the ‘ordinary’ person will be faced with choices for the future that are clearly either irresponsible or responsible. Hopefully, the thousands of initiatives that are springing up will then also provide available pathways to choices of a more responsible life, forging a future in which the colonial past of Europe is replaced with a truly collaborative role vis-à-vis the rest of the world. Thanks to Federico and Daniela for comments. This article originally appeared in India Together. Ashish Kothari has been active with a number of people’s movements in India. He is a member of the environmental action group Kalpavriksh which helps run Vikalp Sangam, a process that brings together people working on economic, social, and environmental alternatives in India, and a website showcasing these initiatives. He is the author or editor of over 30 books and over 300 articles. In 2012, he co-authored the book Churning the Earth, The Making of Global India with Aseem Shrivastava, where they outlined the concept of Radical Ecological Democracy, as inspired by India’s social movements. An ethics of surplus and the right to waste?